Raising hopes for a simple, noninvasive, inexpensive, and easily repeatable test for pancreatic cancer, scientists at Barts Cancer Institute, Queen Mary University, have developed a three-protein biomarker panel that can screen urine samples to identify pancreatic cancer when it is still in its early stages. The panel, the scientists say, has already demonstrated better than 90% accuracy. Moreover, it readily distinguishes between pancreatic cancer and chronic pancreatitis, conditions that are easily mistaken for each other. The scientists settled on just three proteins after conducting proteomic analyses of 488 urine samples—192 from patients with pancreatic ductal adenocarcinoma (PDAC), 92 from patients with chronic pancreatitis, 87 from healthy volunteers, and 117 samples from patients with other benign and malignant liver and gall bladder conditions. The urine samples were subjected to assays using GeLC-MS/MS (in-gel tryptic digestion followed by liquid chromatography-tandem mass spectrometry) and ELISA. Initially, around 1,500 proteins were identified, with approximately half being common to both male and female volunteers. Of these, three proteins—LYVE1, REG1A, and TFF1—were selected for closer examination. Each of the three proteins was elevated in urine samples from PDAC patients, but not in urine samples from healthy patients. Patients suffering from chronic pancreatitis had significantly lower levels than cancer patients. At present, noninvasive biomarkers for early detection of PDAC are not available. The biomarker panel established by the Barts Cancer Institute scientists, however, shows promise. The team is hoping to conduct further tests on urine samples from people in high-risk groups, to further validate the study findings. Dr. Crnogorac-Jurcevic is also keen to access samples of urine collected from volunteers over a period of 5–10 years. 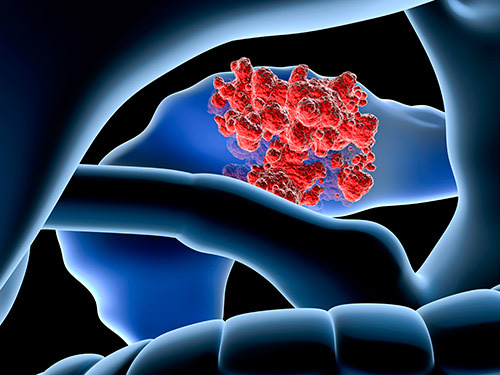 By examining samples from donors who went on to develop pancreatic cancer, this longitudinal information will allow the researchers to see if the three-biomarker signature is present during the latency period—the time between the genetic changes that will cause the cancer to develop and the clinical presentation. With few specific symptoms even at a later stage of the disease, more than 80% of people with pancreatic cancer are diagnosed when the cancer has already spread. This means they are not eligible for surgery to remove the tumor—currently the only potentially curative treatment. Patients are usually diagnosed when the cancer is already at a terminal stage, but if diagnosed at stage II, the survival rate is 20%, and at stage I, the survival rate for patients with very small tumors can increase up to 60%. It is hoped that with early detection, the survival rate for pancreatic cancer will improve. At present, only about 3% of patients found to have pancreatic cancer survive more than five years.